You’ve already figured out what to do with your overripe bananas, but what else can bananas be used for? Unusual uses for bananas mostly include beauty uses, but there are a few others you might not have thought of! After doing a bit of research, I’ll never look at a banana the same way again. 1. Make ice cream! Okay, so this one isn’t that unusual, but it’s delicious and fun. You can find many banana ice cream recipes on Pinterest, too. 2. Use banana and honey to make delicious treats for your pup! 3. Rub the inside of a banana peel on your mosquito – or other insect – bites and you’ll get relief almost instantly! It’s been said that the outside of the banana peel works for this, too, but I have yet to try both ways. 4. Use some chopped up banana as an organic fertilizer for your garden. Combine with crushed eggshells and coffee grounds for best results. You can also use the peels as an addition to your soil. 5. Create a garden oasis for butterflies and hummingbirds. They love bananas, peaches, and watermelon. Add a little orange juice on top of the mushed up fruit to make it even more attractive. 6. To whiten your teeth, take a piece of banana peel and gently rub the inside of it around on your teeth for at least two minutes. The potassium and magnesium are said to absorb into your teeth, to help whiten them. Do this every night for best results. 7. Mash one ripe banana with one tablespoon honey to make a moisturizing mask for dry skin. Banana is also said to help reduce puffy eyes, and soften cracked heels, so using this moisturizing mask on your face as well as your elbows, heels, etc is fine. Leave the mask on for a good ten minutes to let it work its magic. 8. Make a mask to repair dry hair: two overripe bananas, one avocado, and a few tablespoons yogurt. Mix together in a blender, then apply to your scalp and leave in for a good 10-15 minutes before rinsing out with warm (not hot!) water. What’s your favorite “unusual” use for bananas? Let me know in the comments below! These are very interesting–I definitely hadn’t thought of some of them! I knew some but not all these uses. Thanks for sharing! My favorite “unusual” use for bananas is making ice cream. I agree, I don’t think this is unusual. I will pick another one, my fave is using bananas to make a hair mask, I’d love to try this. 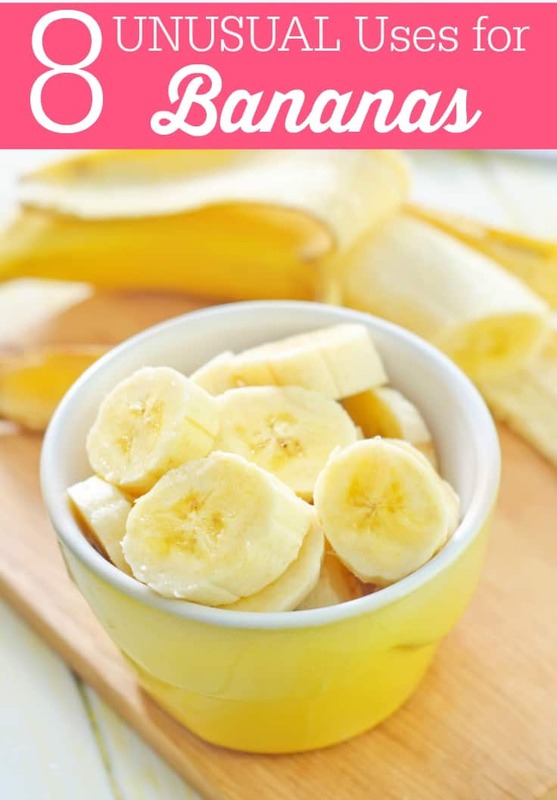 Thank you for sharing this is list of unusual uses for bananas. I haven’t tried this, but apparently banana peels work well as shoe polishers. Definitely have not heard of some of these uses. The whitening teeth one is interesting! I don’t have any unusual uses for bananas. I had no idea there were so many useful ways to use them. Teeth Whitening really surprised me! I knew about #3, but never knew about #6. Didn’t know it could be a teeth whitener! These are some very amazing ideas…I’m not sure if I could put mashed bananas and avocados in my hair though! I just rubbed banana peel on my toddler’s mosquito bites. It seems to be working because he kept handing me the peel and pointing to his bites. Thanks for the tip. I bury banana peels at the foot of rose bushes. Best fertilizer! Rainworms love banana peels as well so if you need to spread a useful rainworm population, bury some banana peels.